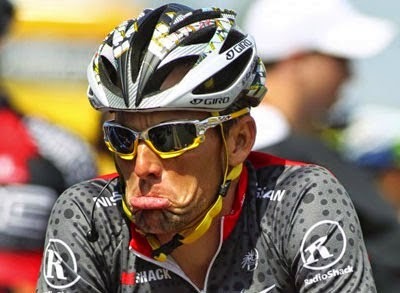 Also known as the world record of the "I was on the brink, but ...", this sad distinction is shared by the two cyclism's champions Raymond Poulidor and Joop Zoetemelk, the first holding the record for the number of podium without a win, the second, the most of second places in the Tour de France. Both must surely eternally curse their unlucky stars. However, contrary than would suggest the nickname "eternal second" attributed to Poulidor, it's actually Joop Zoetemelk who holds the record of second places, having reached six times the second step in 1970, 1971, 1976, 1978, 1979 and 1982, however, the Dutch rider still managed to steal the top spot in the Tour in 1980, finally! Raymond Poulidor also illustrated himself by his equally great misfortune, finishing on the podium eight times between 1962 and 1976, but never having worn the yellow jersey a single once. Well, this world record of misfires still has him earn a popular success rewarding his efforts. 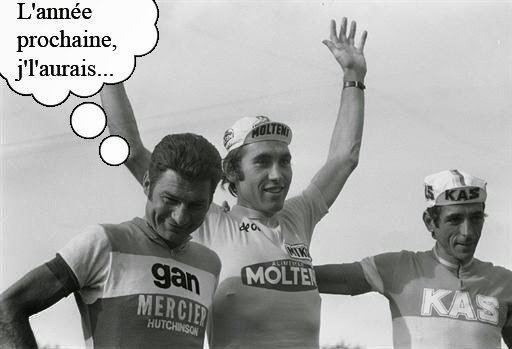 Maybe because he also shares a record with few chosen among the cyclists participating in the Tour de France: in 17-year career, Poulidor (unlike some other runners who were more succesfull - for a time) has never been suspected of doping. A feat in itself (though it may explain why he's never won the Tour). R. Poulidor : "Next time, i win"